I remain amazed by the oddly wonderful series that is "Mission: Impossible." I have a collection of old "Mission: Impossible" episodes from television and at this point, I've accepted that "Mission: Impossible" the television series and "Mission: Impossible" the film franchise will never really be alike. Some of the movies are mere James Bond clones, and others the team is utilized better. Because that was always the biggest difference between other spy fiction, the use of the team and how everyone brought something unique. That still hasn't quite happened, but that does not totally mean that Paramount has been doing it wrong this whole time. The first film is one that I really like, but its not at all what you'd expect from an action spy movie. Nobody was expecting a mind-game movie, and I am still not completely sure I have the movie figured out. I know many fans hated the idea of making Jim Phelps both the villain and a character who died. But again, I still really enjoy the movie. The second film was made by John Woo, and its a very John Woo film and its the most detached I feel from the franchise. The third film made by J.J. Abrams presented a mystery box that never got introduced, and left me bored. Despite the juicy villain Philip Seymour Hoffman got to play. The movies since then have about entertainment, about using the team, bringing favorites back, and having much fun with it all. "Fallout" may be the best one yet. It's the best team movie of the franchise so far, but still makes great use of Tom Cruise in the lead. Because let's face it, Tom Cruise is the face of this franchise, for better or for worse. I don't understand the utter disdain for the guy. Yes, he's a Scientologist and that's really weird, but when it comes to adding emotion and depth to a character while also maintaining a movie star persona, that's remarkable. He's also one of the few people in the business right now who still does all of his own stunts, and there is something truly amazing about watching a person in the middle of stunt whose real, one that doesn't suddenly turn into CGI for the sake of it. Cruise has become so comfortable in the role of Ethan Hunt that he has become him. Much like Simon Pegg has for Benji Dunne and Ving Rhames as Luthor Stickel. These guys are these characters at this point, and even if they were to phone in a performance, which they don't, you wouldn't be able to tell. Cruise may be the lead, but this is a team movie all the way. 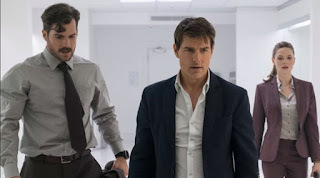 Much like the James Bond franchise, I've remained mystified by the continuity of the "Mission: Impossible" franchise and I am glad this late in the franchise that they are trying to connect things. Alec Baldwin returns as Alan Hunley. Sean Harris returns as Solomon Lane, Michelle Managhan returns as Julia, Rebecca Ferguson returns as Faust. They play key roles in this film, and past films are beginning to link up. There is a new character introduced here who has a connection to the first film and it literally made me woo out loud. This is beginning to feel like a whole story now, and that's always fun in this new age of world building. The film begins with Ethan Hunt getting the oh-so-popular mission briefing. Turns out that the Rogue Nation organization from the last film has reorganized into a group called The Apostles. This group has obtained some plutonium and is planning to build some bombs. When Hunt and his team track down the plutonium, he makes a snap decision to save one of the members of his team. He puts the world in jeopardy in the process. The CIA brings in one of their Agents, Mr. Walker (Henry Cavill) who oversee Hunt and his team, to make sure he gets the plutonium. Before we get too much further into this, let me just discuss Henry Cavill for a bit. The guy is a brute force through much of this movie. His American accent makes me cackle, because he sounds like a commercial for Ford trucks. Cavill has a great onscreen presents, and he's a charisma machine. There is a reason why he works so well as Superman, and this film proves that he's got some dimensions and some range. He's a great future action hero, and really added to splendid fever of this movie. The film is full of twist and turns, which is to be expected with spy films. There is some great action in the movie, some of the best of the entire franchise. I loved that the old school scores from the old TV show were integrated into the film's overall score here, and it had me grinning from ear to ear. This is what mainstream summer blockbuster filmmaking is all about. When people talk about great summer movies, this is something that is going to be used as a shining example. Easily one of the best films of the summer, this is great time.